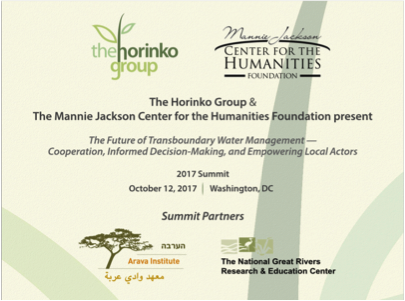 On October 12, THG in partnership with the Mannie Jackson Center for the Humanities Foundation will gather in Washington, DC to convene a Summit entitled, The Future of Transboundary Water Management – Cooperation, Informed Decision-Making, and Empowering Local Actors, which will discuss implications of big data management for improving the human condition from the conflict-torn Jordan River in the Middle East, to the complicated water rights of the Western United States, to the Mississippi River’s cyclic drought and abundance. Empowering local actors to access and utilize data with purpose and confidence is an important step in positioning farm operators, utility managers, and those who govern locally to better self-determine a sustainable path forward. Proof of concept projects will be considered for each region, accounting for social indicators and the human dimension of these natural systems. Stay tuned for the proceedings! To view the Summit overview and agenda, click here. For additional information, please contact Brendan McGinnis at bmcginnis@thehorinkogroup.org.